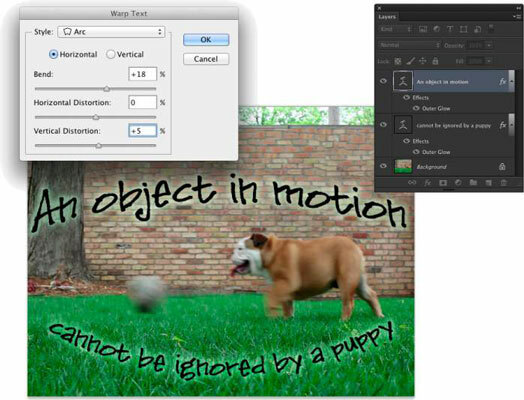 When editing an image with text in Photoshop CC, you can change the line along which your type flows either by using the Warp Text feature or by typing on a path. Type warping uses predefined shapes to which your type is formed (and can be used with both point and paragraph type), and typing on a path uses a custom path (and is used only with point type). Warping type and placing type along a path are great ways to spice up your message as long as you don’t overdo it and make the message illegible or distract from the overall appearance of your artwork. Warp Text is a quick and easy way to bend text, whereas placing type on a path is a more complex — and more controlled — technique. With a type layer active in the Layers panel and a type tool selected, click the button to the right of the color swatch on the Options bar. That opens the Warp Text dialog box, as shown in this figure, in which you choose both the distortion you want to apply as well as the settings. Photoshop offers 15 different Warp Text presets, each of which you can customize by dragging any of three sliders. Negative numbers can be used, too, reversing the warp. You can also set the Bend slider to 0 and adjust the lower two sliders to create the appearance of depth or perspective for a type layer, but keep in mind that the Horizontal and Vertical buttons aren’t available for some of the styles. Warp Text is one of Photoshop’s truly fun features. The best way to become familiar with it is to open the dialog box and test-drive each of the variations. And don’t forget to try the Horizontal and Vertical buttons when they’re available! 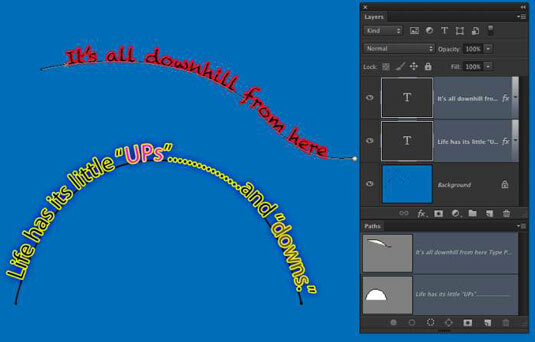 You can use the shape tools or the Pen tool to create a custom path along which you add your text. To add type along a path, simply select the Horizontal Type or Vertical Type tool, click the path, and type. The flow of the type from the point on the path where you click is determined by the alignment option that you select from the Options bar or the Paragraph panel. If the text is left aligned, characters are added to the right of the point where you click (called the point of origin for the type). Left alignment is great when adding type along an open path, such as the upper path in this figure. You might, however, want to choose center alignment when adding type along the top of an arc or circle, so you can click on the top of the arc and not worry about dragging the type later to center it.